1. Open Control Panel, and click Add or Remove Programs. 2. Click Add/Remove Windows Components. Select the Fax Services check box, and then click Next. 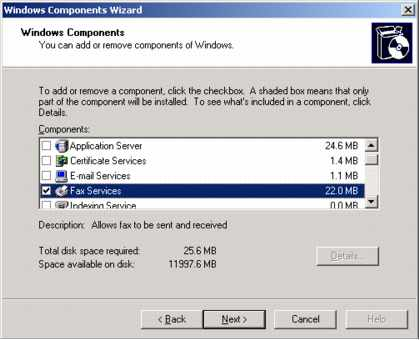 The Windows Component Wizard takes care of the rest. 3. Check that the Microsoft Fax service (`Fax') is started and set to automatic. You can do this from Control Panel->Administrative Tools->Services applet. 1. Click Start, point to All Programs, point to Accessories, point to Communications, point to Fax, and then click Fax Console. 2. On the Tools menu in Fax Console, click Configure Fax, which starts the Fax Configuration Wizard. Click Next to start configuring your fax information. 3. On the Sender Information page, include your name or your business name and your fax number. Everything else on the page is optional. 4. On the Select Device for Sending or Receiving Faxes page, your modem will be selected, unless you have more than one, in which case, select the right one. Specify send and receive options, and whether you'll manually answer incoming faxes or answer automatically when received. 5. On the Transmitting Subscriber Identification (TSID) and Called Subscriber Identification (CSID) pages, enter your business name and fax number. These fields really matter when you're running special fax routing software. Most software of this kind depends on TSIDs to determine where to direct an incoming fax. 6. On the Routing Options page, specify how incoming faxes will be handled. All faxes are stored automatically in the Fax Console, but you can also print a copy or store a copy in a local folder or on your network. When you want to change or verify any of these settings, simply run the Fax Configuration Wizard again. 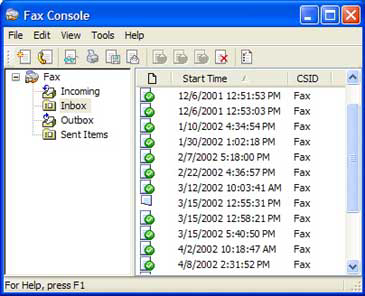 To open the wizard, on the Tools menu of the Fax Console, click Configure Fax. You can fax a document that's stored on your computer by sending to your fax printer. In this section, I'll explain how to fax a document from your computer. If you can print a document, you can fax it. 1. On the File menu of the document, click Print. 2. 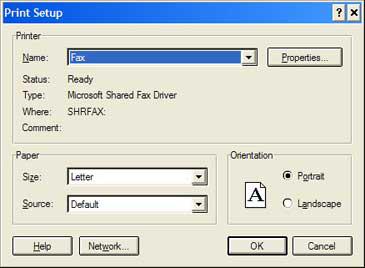 In the Print dialog box, in the Printer name box, click Fax to open the Send Fax Wizard. 3. To supply the recipient's fax number, click Address Book, and select one or more recipients just as if you were sending them an e-mail message. 4. If you've already set up Dialing Rules, skip ahead. If you haven't, click Dialing Rules. If you need to dial an extra digit to get an outside line, or use a special carrier code, or dial an area code even for local numbers, add those settings here, and then click OK to return to the fax sending. Very Important: Telephone numbers must be in the canonical form in which a U.S. number would appear as +1 (626) 555-1212. If you use even a slightly different form such as (626) 555-1212 or 1-626-555-1212, the dialing rules won't be applied and the fax transmission will fail. 5. Select a cover page. Choose from the list or specify no cover page at all. 6. Specify when the fax should be sent as well as the fax's priority. Priority only matters if you're stacking up a number of faxes to be sent at a particular time. In that case, the order of sending will be determined by the priority you set. 7. Finally, you're presented with a screen recapping the details of the fax and offering a chance to preview it. If the fax is a multi-page one, you'll be able to preview only the first page. 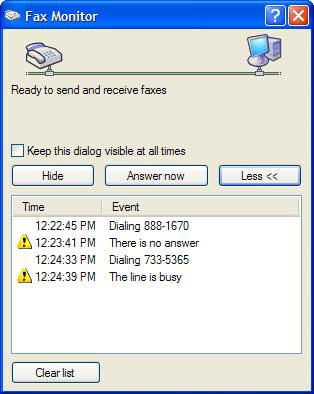 If you're sending the fax right away, the Fax Monitor, shown below, will start when the dialing does.